WASHINGTON — Global warming is going to steal away some of those postcard-perfect weather days in the future, according to a first-of-its-kind projection of nice weather. "It's the type of weather where you can go outside and do something fun," said study lead author Karin van der Wiel, a meteorology researcher at Princeton University and the National Oceanic and Atmospheric Administration . "It's not too cold. It's not too hot. It's not too humid." For the past three decades, the world has averaged 74 mild days a year. But by 2035 that will shrink to 70 and then 64 by the last two decades of the century, according to the study, published Wednesday in the journal Climatic Change . Mild weather was defined as between 68 and 86 degrees (18 and 30 degrees Celsius) with low humidity and no more than a trace of rain. 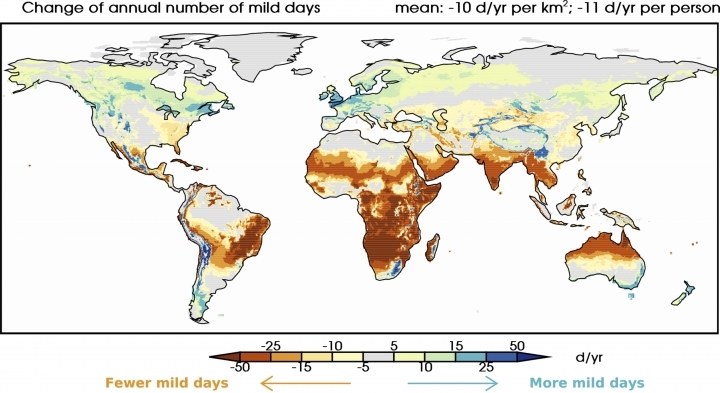 The scientists didn't specifically focus on whether the loss of mild days has already started globally, but they did see it happening in much of Africa and South America, Van der Wiel said. It's not just fewer nice days to enjoy. Fewer mild days will also harm agricultural production and allow disease carrying insects to thrive more in more places, said University of Georgia meteorology professor Marshall Shepherd.